He’s a Michelin-starred chef with 14 restaurants in London and Asia and he’ll be cooking dinner for 12 in the home of one lucky Ocado customer. We chatted to Jason Atherton about food trends, the London restaurant scene and throwing the perfect dinner party. Q What makes the perfect dinner party, in your opinion? Any advice about choosing the food and wine? A If you’re hosting a dinner party keep it really, really simple. Stick to the basics and do simple dishes like white wine with fish, shellfish, chicken or rabbit. If you’re going to serve meat, choose a Côtes du Rhône wine if it’s a lighter meat, and a Burgundy or a Bordeaux for a heavier meat. Always buy ingredients that are in season – the meal will just taste better – and always make sure you spend more time as the host, not the cook. Q London is now one of the world’s restaurant capitals. How do you think this has come about? What do you make of the foodie/restaurant scene in the UK at the moment? eating and where their food comes from. It’s been a natural progression. Q You’ve opened many successful restaurants in London and Asia. Your cooking is obviously central to that. What are the other key factors of your success? A Hard work, a solid team and really just making sure that with every restaurant we launch we continue to reinvent dishes, do new things and keep a finger on the pulse. Q You’ve worked with some big names in the past. Who would you say has been your greatest cheffing influence? A Ferran Adrià (El Bulli) and Thomas Keller (The French Laundry) have been two massive influences in my cooking life – I owe them both a lot. Q Is there any one restaurant experience that particularly impressed you as a diner? A El Poblet (Quique Dacosta’s restaurant) in Spain – I had an amazing experience there. Q How would you describe your approach to cooking? A Truthful and simple, that’s what we do. Supporting small, local suppliers is something very dear to our hearts. Q What things do you consider when sourcing ingredients? A The exact same thing really; we’re always looking for new ingredients but, equally, we want to support local farmers and put something back into the food chain to help people. Our relationships with our suppliers are very important – we have a mutual respect of our trades. Q You clearly have a keen eye for what’s new in modern cuisine; are there any trends you’ve noticed emerging in the food world? A Yes, I think people are moving further away from fussy food and going for natural foods. For me, the next big thing will be regional cuisine. There’ll be restaurants cooking only food from northern parts of Japan or western parts of China. I see people picking regions of food and looking deeper into old-fashioned ways of cooking, trying to interpret dishes. I think people will look at food history a lot more. Q How do you relax when you have time off? A I run, I play golf – though I really don’t have that much time off! Q What is your earliest food memory? A Eating sardines on toast with my stepfather when I was about six years old – delicious! Q What’s the one ingredient you can’t live without in your kitchen? Q Finally, what is your guilty food pleasure? 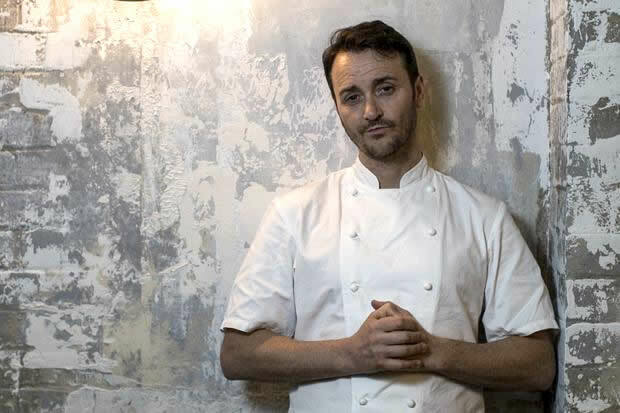 Win Jason Atherton cooking for you and 11 friends in your own home! This entry was posted in Competitions and Prize Draws, Talking Ocado and tagged celebrity chef, Chef, competition, Cook, Cooking, cooking from scratch, cooking tips, dinner party advice, enter now, food, foodie, good food, Jason Atherton, Ocado, Ocado deliveries, Ocado groceries, ocado.com, Win, wine by Ocado. Bookmark the permalink.